31 Dec 2004 Changed the outdated venue photo link for O'Banion's (Chicago) on the dates page to point to this entry on the excellent Chicago Bar Project site and added the same link to the O'Banion's venue notes page. Created venue photo link for the 950 Lucky Number (Chicago) on the dates page, pointed it to the Chicago Bar Project's Club 950 page, and updated the Club 950 Lucky Number venue notes page. 28 Dec 2004 Added new publicity photo for Zen Arcade and updated Publicity Photo index page. 28 Dec 2004 Updated Zoogie's (Minneapolis) venue description based on info received from Wendy Dunham. 22 Dec 2004 Added a club schedule flyer listing Grant's cancelled 05 Oct 1994 Nova Mob date at Rhythm & Brews in Indio CA, and also updated the venue notes for the place. Flyer image and new club info both courtesy of SST veteran Tom Troccoli. Updated the 1994 poster index page and the link on the dates page. 11 Dec 2004 Added setlist for Mould 18 Nov 2004 Grog Shop (Cleveland) set, linked it to the dates page, and added recording description to live audio page. 28 Nov 2004 Replaced the truly awful old 18 Oct 1983 W.O.W. Hall (Eugene OR) gig flyer image with a marginal upgrade, an image yanked from a recent eBay listing and subjected to a certain amount of reconstructive surgery. Updated the 1983 poster index page and the link on the dates page. 27 Nov 2004 Added setlist for live segment of 25 Nov 2004 Blowoff set, linked it to the dates page, and added "Saturday Night All The Time" to the titles page. 27 Nov 2004 Added Burn To Shine, Vol 1 DVD (featuring Bob Mould) to annotated discography and updated the commercial video section of the summary discography. Thanks to Patrick Ley for posting this information to the Sugar list. 26 Nov 2004 Updated Ritz (Novellara, Italy) venue description based on info received from Giancarlo Frigieri. Updated Foolkiller (Kansas City) venue description with anecdotes and information provided by Rod McBride. Added link to Peter Scholtes' must-read writeup of the 21 Oct 2004 "reunion" (with photos by Tony Nelson) to the gig stills page for that date. 25 Nov 2004 Added Graffiti (Pittsburgh) venue description and linked to dates page. 25 Nov 2004 Added a whole bunch of new flyers: 1979 (undated generic), 21-22 Jul 1980 Entry, 09-10 Sep 1980 Entry, 28-29 Mar 1981 Duffy's, 15 Jun 1981 Sam's/Entry, 13 Nov 1981 Entry, 31 Dec 1981 Goofy's, 05 Mar 1982 Macalaster Union, 13 Mar 1982 Goofy's, 20 Jan 1983 Rock Island (Houston), 30 Mar 1983 1st Ave, 09 Oct 1985 Graffiti (Pittsburgh), 26 Oct 1985 Gorilla Gardens (Seattle), 09 Jan 1986 Concordia Ballroom (LaCrosse WI), 01 Feb 1986 Phantasy (Lakewood OH), 13 Feb 1986 UGA, 19 Feb 1986 Sherwood (Indianapolis), 17 Aug 1990 Vrije Vloer (Utrecht), and 25 Nov 2004 9:30 (DC). The vast majority of these images were plucked from the Minnesota Historical Society's most excellent online collection of Hüskerabilia. Updated the appropriate poster index pages (no point in listing them, since most were affected; master list on Poster Gallery page). As always, flyer links were added to the dates page. 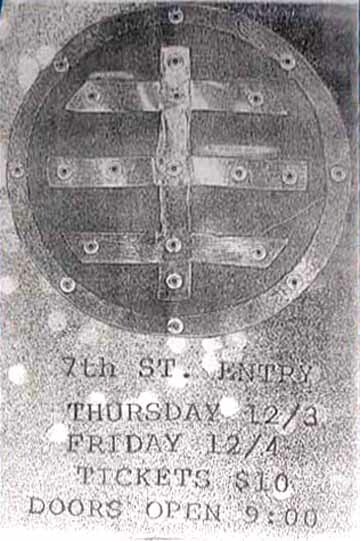 One additional change, based on info gleaned from the MHS site, was to re-identify the 24 Mar "Sam's" flyer (no year or day of week specified) as referring to the Minneapolis Sam's (later 1st Ave), rather than the mysterious Dayton OH Sam's to which this Flipside article refers, and set the year as 1981. 24 Nov 2004 Corrected the date of the "26 Jul" 1985 Hacienda (Manchester) gig, long held suspect, based on information received from Pete from England, who attended the show and determined from his notes that the actual date was 25 Sep 1985. Added explanatory notes to the live audio section and fixed the dates page. 22 Nov 2004 Changed projected Body Of Song release date to 26 Jul 2005, as announced by Bob at the Double Door last night and reported by Conor McGrath. Later in the day, Cameron Metcalf noted that Bob is now listed among Yep Roc Records' stable of artists, and the Bob entry on their site shows an album (CD-YEP-2091) to be released on the above date. Updated the BOS entry in the Summary Discography. 21 Nov 2004 Updated Rock Island (Houston) venue info and corrected club name (thanks to Kyle Hester). Also corrected name and updated venue info for Newton Theatre, and added an explanation (thanks to Troy) of the abrupt termination of the Hüskers' 24 Jun 1984 performance there to the setlist description. Even found a picture of the place in its current incarnation as a CVS and linked it to the dates page. 21 Nov 2004 Added new Mould songs, "Always Tomorrow," "Fucked Underneath Days," and "(Shine Your) Light Love Hope" to song titles page. 21 Nov 2004 Added/upgraded venue exterior photos for Double Door (Chicago), Grog Shop (Cleveland), Rex Theatre (Pittsburgh), STUK (Leuven, Belgium) and Wil-Mar (Madison);fixed broken Wil-Mar venue link; made appropriate updates to dates page. 21 Nov 2004 Added 25 Nov 2004 live Blowoff date @ 9:30 Club to dates page. 20 Nov 2004 Put up Mould 19 Nov 2004 Blind Pig gig photos (thanks to photographer Jeremy Frey) and linked to dates page. 15 Nov 2004 Added new Mould songs, "Days Of Rain," "Love Escalator," and "I Am Vision, I Am Sound" to song titles page. 24 Oct 2004 Added missing song to 21 Oct 2004 setlist, courtesy of John Mulhouse. 24 Oct 2004 Added flyer images for 04-05 Jun 1982 Calgarian and 03 May 1985 Church (Montréal) gigs, greedily and shamelessly snatched from this cool site (thanks to pal Lasse W. for the pointer); added corresponding flyer links (and a listings for the two Calgarian shows, previously unknown) to the dates page; Updated the 1982 and 1985 poster index pages; updated venue info page for The Church. 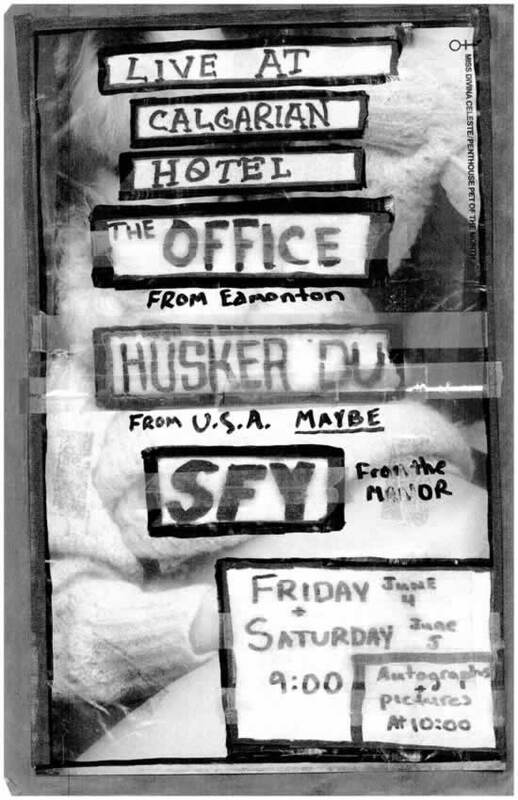 23 Oct 2004 Added flyers for 13 Dec 1980 7th St Entry (Minneapolis), 28 Aug 1985 1st Ave (Minneapolis), 30-31 Mar 1987 1st Ave (Minneapolis) and 03-04 Dec 1987 1st Ave (Minneapolis) Hüsker gigs; updated 1980, 1985 and 1987 poster index pages; and added links to corresponding entries on dates page. Also added listings for the 13 Dec 1980 date (previously unknown) and tonight's Grant gig at the Turf Club to the dates page, plus a venue photo for The Quest. 23 Oct 2004 Added two new Jan 2005 Bob gigs (Paradise, Boston; Ram's Head, Annapolis) to dates page and fixed broken Paradise link. 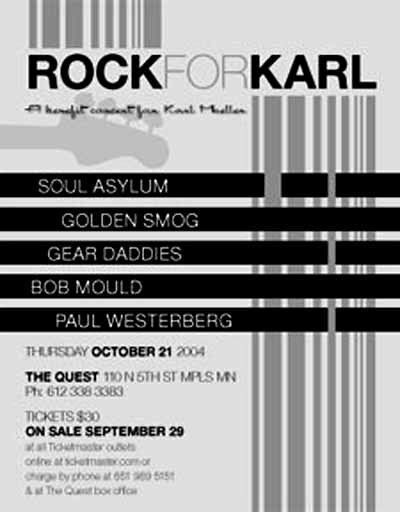 23 Oct 2004 Added setlist, stills page and gig poster for Bob's 21 Oct 2004 Rock for Karl (Quest Club, Minneapolis) show (with surprise Grant Hart appearance). Updated dates page and 2004 poster index page. 16 Oct 2004 Added Bob's 05 Oct 2004 WEDrock (9:30 Club, DC) setlist to dates page. 16 Oct 2004 Updated Diamond Club (Toronto) venue description after being informed by Douglas Wright that it's the same location that's now the Phoenix Concert Theatre. Fixed broken link to the Phoenix on the dates page. 02 Oct 2004 Added Grant's 01 Oct 2004 7th St Entry gig to dates page. Added setlist reconstructed from Sugar list post. Updated song titles page and cover songs page to reflect Grant's playing "No Woman No Cry." 01 Oct 2004 Added second flyer, freshly swiped from eBay listing, for 22 Mar 1987 Temple University (Philadelphia) gig and updated 1987 poster index page. 29 Sep 2004 Added listings for two more fall Bob shows (Minneapolis, 21 Oct; Milwaukee, 22 Nov) to dates page. 29 Sep 2004 Added note that SST-908 (Metal Circus 10") was also issued in blue vinyl. 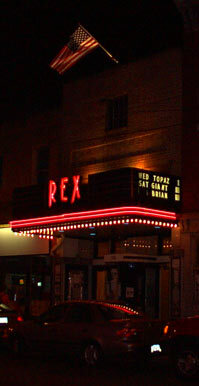 17 Sep 2004 Added Bob's 16 Nov 2004 Rex Theatre (Pittsburgh) to dates page. Added WEDrock poster and updated 2004 posters page. 13 Sep 2004 Added listings for two new Dec 2004 East Coast Bob shows to dates page. 12 Sep 2004 Added listings for Bob's Nov 2004 Midwest + Brooklyn mini-tour to dates page. 10 Sep 2004 Added Bob's 05 Oct 2004 9:30 Club gig (WEDrock benefit) to dates page. 28 Aug 2004 One Step Beyond identified by "Arlene & Wayne" as venue for 18 Oct 1990 Mould gig in Ottawa. Dates page updated accordingly. 28 Aug 2004 Added Metal Circus coffee mug description to oddities page. 21 Aug 2004 Added Grant's 21 Aug 2004 Lawrence KS Jackpot Saloon gig (North vs. South: Hard-Pop Rockband and Singer-Songwriter Festival) to dates page. 07 Aug 2004 Added Grant's 04 Aug 2004 1st Ave gig to dates page. 01 Aug 2004 Added live recording notes for two Crystal Pistol (Tulsa OK) shows, 10 Aug 1982 and 15 Jan 1983. Added links to dates page. 01 Aug 2004 Added Candy Apple Grey coffee mug description to oddities page. 18 Jun 2004 Added 22 Jun 2004 Hart 1st Ave gig to dates page. 17 Jun 2004 Liberty Lunch identified by Emily Leeper as venue for 04 May 1986 Hüsker Dü Austin gig. Updated dates page, fixed broken Liberty Lunch link and added venue photo link. 08 Jun 2004 Added gig photo for 04 Feb 1986 Paradise (Boston) show and updated dates page. 08 Jun 2004 Updated venue notes for City Gardens (Trenton NJ) based on info provided by blackgold ofdasun. 06 Jun 2004 Added setlists for Sugar 11 Dec 1992 (Vooruit, Gent, Belgium) and 03 Jul 1993 Torhout Festival (Belgium) shows, and Grant Hart 18 Dec 2002 (Stuk, Leuven, Belgium) show, courtesy of Maarten Demetter. Added links to dates page. 04 Jun 2004 Updated link for Stuk (Leuven, Belgium) and put in link to page of venue photos on dates page. 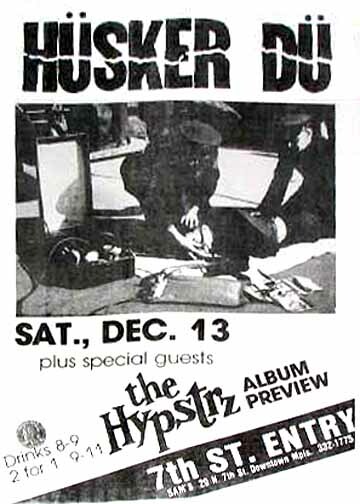 17 May 2004 Added flyers for 22 Jun 1985 Century Hall (Milwaukee), 25 Mar 1986 Bierkeller (Bristol UK) Hüsker Dü gigs and 22-23 Oct 1998 Manchester/Wolverhampton Mould LDAPS gigs; updated 1985, updated 1986 and 1998 poster index pages. Linked the new images to the dates page. 12 May 2004 Added blurb on Budkon series of counterfeit flexidiscs. Added entries for the five Budkon Hüsker titles to the Summary Discography and corresponding entries to the Bootleg Audio section of the long-form discography. Added artwork pages for each: One Step At A Time, Never Talking To You Again, The Biggest Lie, Pride, Standing By The Sea. 10 May 2004 Established Century Hall (Milwaukee) as the venue for the 22 Jun 1985 gig and updated dates page. 09 May 2004 Augmented OZ (Chicago) venue notes and added more details about the infamous "Blue Paint" show there based on info provided by former OZ owner Dem Hopkins. 30 Apr 2004 Added 18 May 2004 Mould 1st Ave gig to dates page; added "Composure" and "Two-Headed Boy" To song titles page; added "Two Headed Boy" entry to songs covered by HD page. 25 Apr 2004 Added 4 Nova Mob t-shirt pages using info and images provided by Peter Glob Frandsen of Denmark: Last Days Of Pompeii tour, Shoot tour, and self-titled Nova Mob album tour (two designs). Updated tee shirt list page. 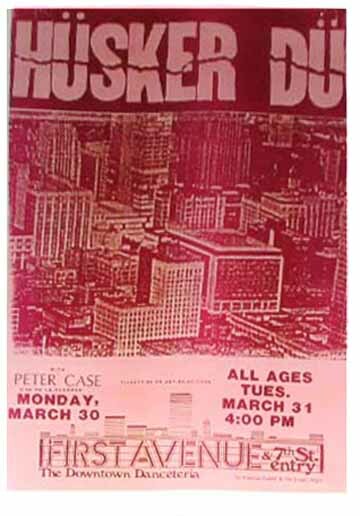 25 Apr 2004 Added flyer for 15 May 1985 Peabody's (Cleveland) Hüsker gig; updated 1985 poster index page, and added links to corresponding entry on dates page. 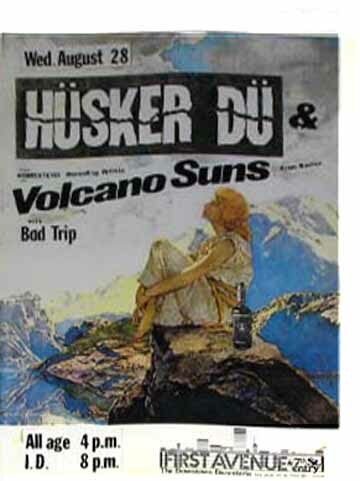 18 Apr 2004 Added flyers for 10 Sep 1985 Saltlageret (Copenhagen) and 01 Jun 1987 Carlton (Copenhagen) Hüsker Dü gigs, courtesy of Lasse W.; updated 1985 and 1987 poster index pages. Linked the new images to the dates page. 16 Apr 2004 Added link on dates page to page of 03 May 1985 Church (Montreal) Hüsker Dü gig stills, courtesy of photographer Linda Dawn Hammond. 15 Apr 2004 Reprinted Charles Plymell's poem "For Grant Hart" (from his new book Some Mothers' Sons) and linked it to the Curiosities page. 15 Apr 2004 Added flyer for 18 Jun 1984 Electric Banana (Pittsburgh) Hüsker gig; updated 1984 poster index page. Also found better link for Ralph's Diner. Added appropriate new links to dates page. 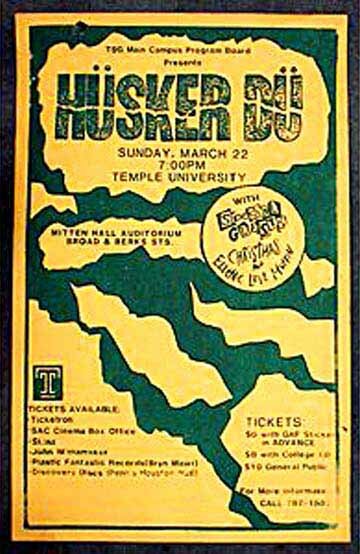 12 Apr 2004 Added flyer for 22 Mar 1987 Mitten Hall (Temple U) Hüsker gig; updated 1987 poster index page, and added links to corresponding entry on dates page. 11 Apr 2004 Added 28 Apr 2004 Mould gig to dates page and put up flyer image for the date. 02 Apr 2004 Added new publicity photo for The Living End and updated Publicity Photo index page. 02 Apr 2004 Added 10-11 May 1997 gig poster and updated 1997 poster index page. Added 31 Jan 1986 performance stills page displaying gig photos newly acquired from Robyne Lee. Updated dates page with links to this stuff. 30 Mar 2004 Upgraded images on Black Sheets tee #2 page. 30 Mar 2004 Added Grant's 01 Apr 2004 Turf Club gig to dates page. 23 Mar 2004 Added entry for the Today's Best Music VA freebie compilation to the Giveaways section of the Annotated Discography; updated the Summary Discography, and put up an artwork page for the new entry. 21 Mar 2004 Added Odd Cravings #3 LSR review and updated Magazine Articles index page. 19 Mar 2004 Changed 03 Mar 1985 San Diego venue to Carpenter's Hall, added venue page, and updated dates page. 19 Mar 2004 Made minor addition to GS Vig's page and credited Joel Ward. 19 Mar 2004 Credited Sarah Holloway for nudging me into adding this page. 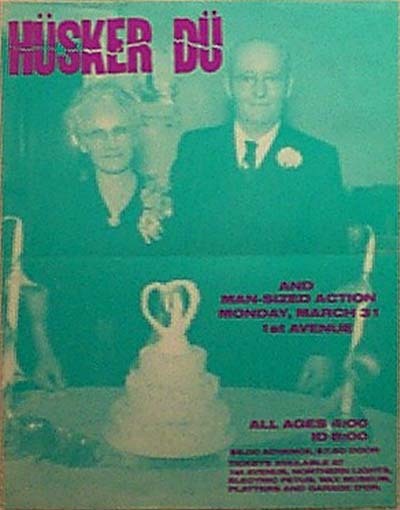 05 Mar 2004 Added flyers for 18 Jan 1983 Tucson Backstage Hüsker gig and 09 Dec 1994 Hollywood Palladium Sugar gig; updated 1983 and 1994 poster index pages, and added links to corresponding entries on dates page. 02 Mar 2004 Updated Wig In A Box entry in Annotated Discography and added artwork page. 02 Mar 2004 Added Son of Quincy #2 interview and updated Magazine Articles index page. 29 Feb 2004 Added Metal Circus publicity photo and updated Publicity Photo index page. 29 Feb 2004 Inflicted a tiny dent in my huge pile of undocumented CDs by adding entries for the Postmodern and Newbury Comics/The Early Years Vol. 2 VA compilations to the Commercial Releases section of the Annotated Discography; updated the Summary Discography accordingly, and put up artwork pages for both new entries. Also added the Beat Godivas cover of "2541" to the Songs Covered cross reference and the Covers and Tributes page, and put up an artwork page for the album (Jerkwater Town). 28 Feb 2004 Updated venue notes for Foolkiller (KC) based on info provided by Ronny Ripper. 28 Feb 2004 Added tee shirt entries for generic blue and red tee, black Metal Circus tee and Hebrew tee, and added the new links to the Hüskerwear page. 27 Feb 2004 Broke out acknowledgments list from Annotated Discography intro page and made it a separate page. 25 Feb 2004 Added 08 Apr 2002 Royal Oak MI Mould setlist and corresponding link from dates page. 18 Feb 2004 Added note questioning accuracy of 26 Jul 1985 Manchester Hacienda date. 18 Feb 2004 "Stonehill Labour Club" corrected to "Stow Hill Labour Club" on dates page and link to a club picture (of sorts) added. Corresponding venue page updated. Info provided by Martin Bowen Jones. 05 Feb 2004 Augmented Green Parrot venue notes based on info from former owner Gail Yaccarino. 04 Feb 2004 Broke out Hüsker Dü links from my personal links page and moved to a separate page. 02 Feb 2004 After mucho googling, concluded that "Dannebrog Hall" was much more likely to have been named "Danneborg Hall," and updated the appropriate venue notes page accordingly. 30 Jan 2004 Thanks to a most interesting exchange of correspondence with Douglas Mays, early denizen of the Seattle punk scene, came to recognize the distinction between Gorilla Gardens and the Gorilla Room. Updated the venue notes page for the former, added one for the latter, and fixed the dates page. 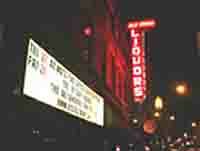 18 Jan 2004 Learned from correspondent Bob Gauvin that the May 1986 Vancouver gig took place at a club called Luvafair. Added a venue notes page for the place. After a bit of searching unearthed some photos shot by Stuart Smith, obtained his permission to use a few to create a page of club exterior shots. Linked the two new pages to the dates page.